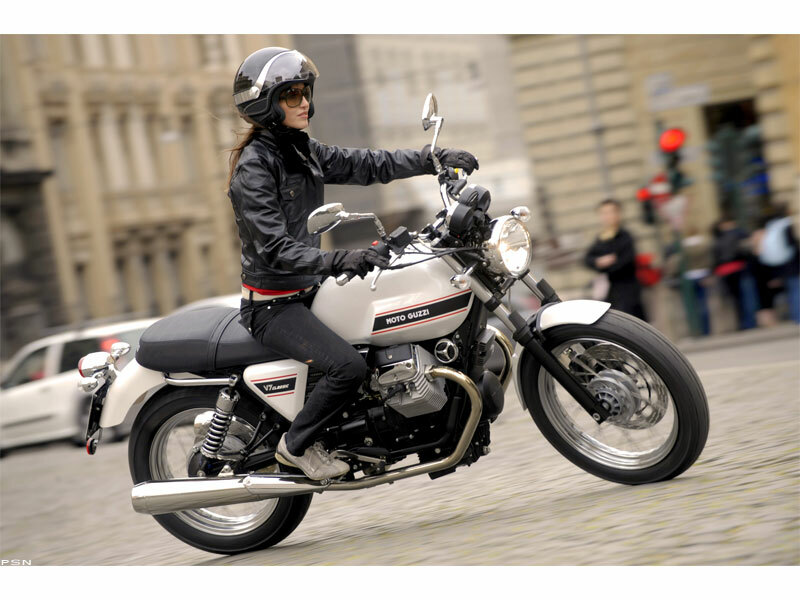 Could the new Moto Guzzi V7 Classic be one of the Best Motorcycle Picks for Women? I’m going to preface this by saying that my wife, Sheila, believes the old adage stating, “If a man gives advice to a tree in a forest, he’s still an idiot”. She’s probably right, so I’m basically going to line up my assumptions from a few women that I’ve shown pictures of Moto Guzzi’s new V7 Classic to and discussed it’s features with. I also OWN this bike so it’s the coolest thing on the planet as far as I’m concerned. 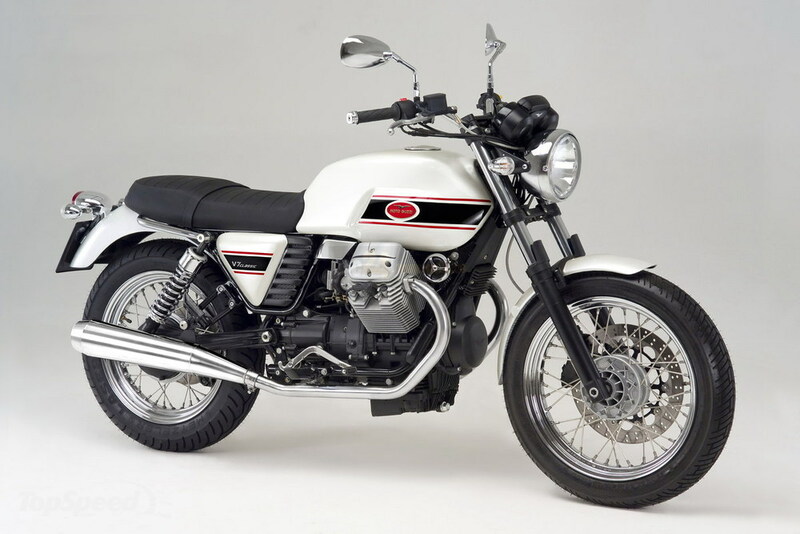 Moto Guzzi introduces the V7 Classic this year to its line-up. It’s a standard motorcycle in the 750cc class that has tapped into the “retro” look that has become increasingly popular. It’s also a nice “standard” bike that is, according to Moto Guzzi, “A stunning mixture of modern tech and retro styling, based upon the 1967 original (see my Eldorado). Easy to parking and nimble with respect to low speed moves. Most Women I talked to wanted a “Standard” upright seating position, not too far forward like a sport bike, and many weren’t thrilled with a laid back cruiser position. Lower seat height. 100% demanded this. Good “grunt” — Most that I talked to didn’t care about absolute top speed or eye-blurring acceleration — I heard, over and over again, “plenty of power” to get in front and out of the way of heavy traffic and dangerous situations. They wanted to “feel” that it could reach “mature speeds” quickly, especially on freeway ramps and exits. Reliability was also a big issue. I even heard a few say that they wanted to be able to do light maintenance themselves. Scaled to fit. The bike had to have proportions that matched the rider. They didn’t want to look “swallowed up” in the bike. Clean lines and looks — no flames, dragons, weird eyeballs or transformer-toy looks. OK. I’m not going to spin this and make this posting longer than it should be. I’m going to state the facts about the V7 Classic and discuss what I currently know about the bike and promise to ride it as soon as there’s a good thaw in Chicago. Motor: 90° air/oil cooled transverse v-twin with 2 valves per cylinder. This bike is going to be docile at low speeds, light enough to maneuver around easily in neutral and parking situations, and it is going to handle very predictably at speeds, especially with the low seat height and “standard” riding position. You’re not going to run circles around the sportiest models, but driving with skill, this bike will stay up with those in it’s horsepower class, and look damned good doing it. This particular motor’s been around since the late seventies, and it has gotten better and better, more refined and evolved over this time. It’s reliable, easy to maintain, not messy because it has shaft drive instead of chains that must be lubricated and adjusted regularly, and there’s just not a lot of moving parts to break. With a better-than-10:1 horsepower to weight ration, it’s going to accelerate well and scoot up to 100, but the 48 horsepower is not going to get too much attention from John Q. Law. It’s a great bike that falls into a “first bike” class, yet it’s not something that you’ll “grow out of” or want to replace with something bigger very quickly, if ever. There’s always room in every garage for a nice practical standard, and that’s why I’m looking VERY hard at this bike to add to my collection in the spring. I believe that it’s going to be great for “the other gender” to get around in the city with, and I’ll be happy to pull up at Chicago eateries astride this extremely cool, retro bike. Guzzis are known for low-end grunt, and this bike has the DNA — As soon as I put some miles in, I’ll verify what I’ve predicted here, and see if I’m correct. Please feel free to comment and let me know what you think, I’m truly interested and will answer any and all questions. This entry was posted in bike reviews, Choosing a motorcycle, Motorcycles and tagged Best Bikes for Women, Women's motorcycles. Bookmark the permalink. I KNOW you are right because the Nevada is the perfect bike for women; I’ve talked to women who ride Nevadas. The new V7 Classic is not that far removed from the Nevada. Guzzi has really been missing out on properly marketing both of these bikes. And you know who HD’s primary target audience is right now? I think you’re right on target. 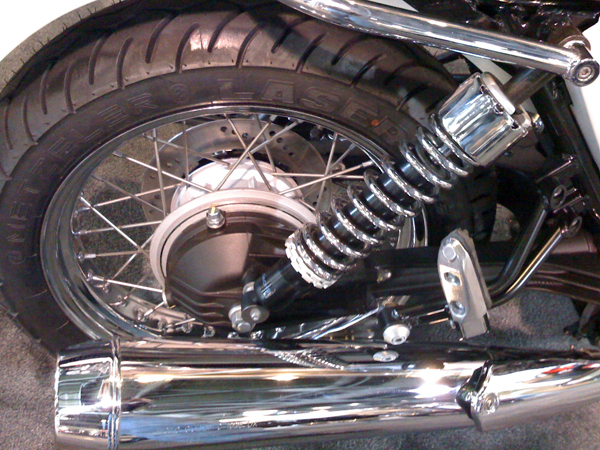 The Sportster 883 comes in at around $8000 base, and I think that the V7 is going to compare quite favorably, since I would really, really like to see anyone get out of a Harley store without buying at least $1000 worth of stuff to set the bike up. 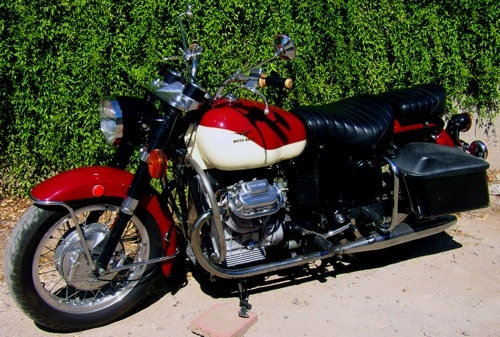 As far as the V7 Classic goes, you cut the check, get the keys and twist the throttle. You don’t need to have anything like Guzzi underwear, belt buckles and gigantic, flame-embossed decals for the back windows of your pickup — The Guzzi is a statement unto itself. I think the Sportster is a fine bike and that the Harley dealers are probably the most astute bunch of people selling bikes with respect to actually “selling” them. 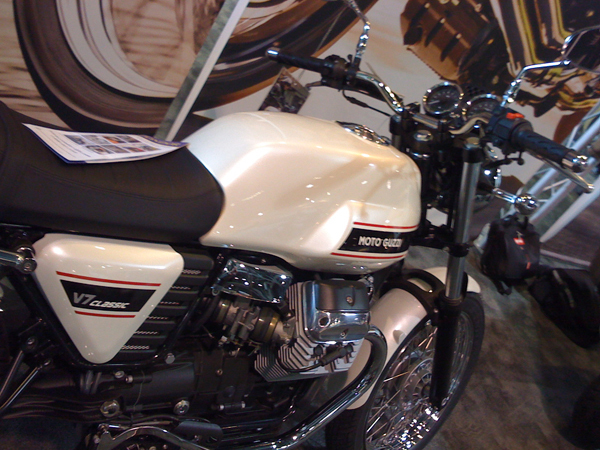 Oh, and the Sporty’s weight comes in at just about the same as a Guzzi Cal Vintage!, about 38% MORE than the V7 Classic! Hog indeed. I believe that the Guzzi represents and alternative to the Sportster’s ubiquity. There’s going to be a lot of people out there that are conformist and want to “belong” to the whole Harley thing, and while that’s fine, discovering how truly wonderful Guzzi people are is just a side benefit to the quality and ride that you get when you twist the throttle. With respect to the small block Guzzis generally, they are subtle and terribly under rated. Great bikes for women indeed, as you suggest but great bikes also for riders across the board especially new riders AND really great around town commuters. The 750 Breva, Nevada and I’m sure, although I haven’t experienced one yet, the new V7 all have the comfort, sublte suspension, agile handling, superior fit, finish and attention to detail that all things Guzzi demand. In fact in the last few years I’ve sold many Brevas and Nevadas to highly experienced riders as well who really considered the small blocks as value priced, entry level Guzzis and have come to enjoy and resect the somewhat underpowered machines so much that they do not want to trade up to anything else. My oldest son Mike is one. At 29 years he bought his 750 Breva 4 years ago because he didn’t have the change to pop for the V11 that he really wanted. Now he can afford something stronger – he just doesn’t want it any more. Go figure. Stumbled onto your site after seeing your messages on the Ducati ST List. I would like to second what ‘Slam’ says about the V7 being a good bike, period, no qualifications “for women”, “first bike”. I am one of those who has been riding motorized cycles (as well as the pedal powered ones -Colnagos, yes!) for 50 years. And after the last five on my ST2 I am beginning to think I have passed my ideal bike size, weight, etc. Much as I love the ST I made the ‘mistake’ of taking a test ride during the last Ducati Demo day on a Monster 1000. Felt like a super motard compared to the ST. What a difference a little weight can make. And I’ll bet the Moto Guzzi carries its weight low. Narrow engines with low CGs are something that we lost along the way in motorcycle design over the last few decades. Anyway, before I trade the ST for a Monster I will have to give the V7 a fair comparison. In general I agree with your thesis, BUT, at 31.7″, the seat height on this bike is not gonna make a lot of women happy. That’s about what a stock Bonneville comes in at, and even lowered, my 5’6″ wife has a bit of a problem with the Bonnie – has to wear boots with built-up soles. 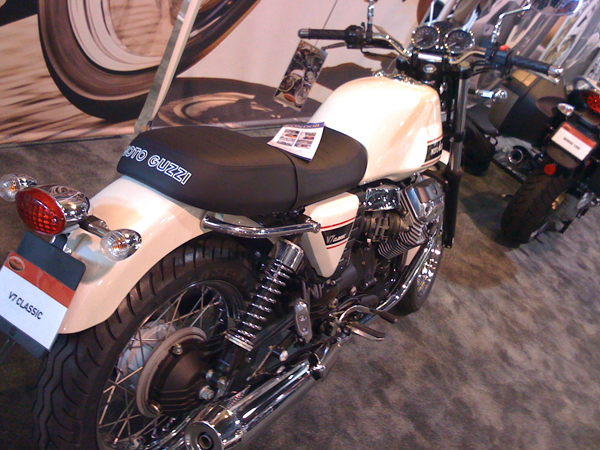 Whereas with her Nightster – seat height ~ 25(!) inches – she can flat foot it comfortably in sneakers. So, advantage Harley IN THIS REGARD. Other factors may well favor the Goose. Personally, I think it’s a great looking bike. The shorter seat height on the Nightster/Rebel/others are out there. I know that you could probably drop the Guzzi another inch if you got creative. I think the weight and nimble nature of the Guzzi would far outweigh much of the competition on a holistic basis — I’ve ridden both the Bonnie and other Sportsters, and I believe the Guzzi is more fun for anyone from beginner to advanced, incredibly easy to maneuver in parking situations, maintenance free and the better handler in an unmodified state. It handles like a scooter in the city. It builds confidence in new riders and they won’t outgrow it. Maintenance is a big issue, too. I don’t know anyone that likes lubricating and adjusting chains. 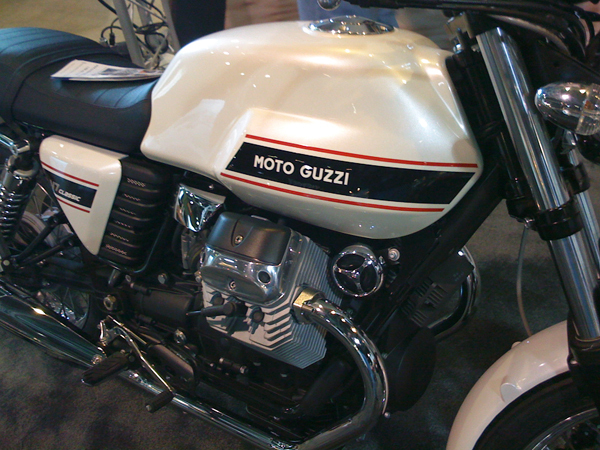 The Guzzi is a “kick the tires and light the fires” kinda bike. It has less horsepower than the others, but frankly I didn’t notice this anywhere from keeping up with my buddies in the twisties to an extended 80mph cruise on the “stretchtops”. 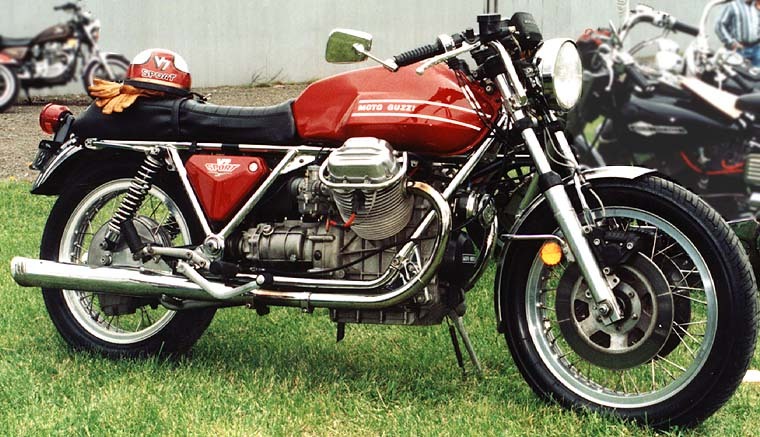 There’s always going to be the “right bike” for someone, and the Guzzi may not be it — I think it’s just important to spend some time considering it against some of its more “higher production number” rivals. It’s one helluva bike. That’s why it’s my main ride. Actually the engine has TWO valves per cylinder, like all the other small-block engines. You’re right. You’d think that since I owned one I’d have ensured that the posting was correct. I changed it. I am a woman and I own this bike. It’s a dream bike for a girl who likes to ride! Just thought I would let you know I am a first time biker. Even before I have passed my test I bought a 2011 Guzzi 750 Nevada Classic Anniversario. Yes I can testify that my bike (named “Bella”) is such an easy ride – on the day of delivery I hopped onto her (without any formal training) and just started to ride-to-practice. It’s a very stylish and good sounding beginning to the world of motorcycling. I am very much blown away. Btw I’m male!